New Items Added for Sale-A-Bration Final Days! Wow – can you believe it?! Just yesterday we were dealing with the sad news that the 6″ x 6″ Glimmer Paper was all gone. And today, Stampin’ Up! has announced the New Items Added for Sale-A-Bration Final Days! There’s only 10 days left of Sale-A-Bration, and now you can choose from 7 new items as your FREE choice – and they’re from the Annual Catalogue! Please note that in order to get these items for FREE as your Sale-A-Bration picks, you MUST USE the new numbers, as shown in the list above. Using the product number in the catalogue will end in you being charged for the item – which is NOT what you want! 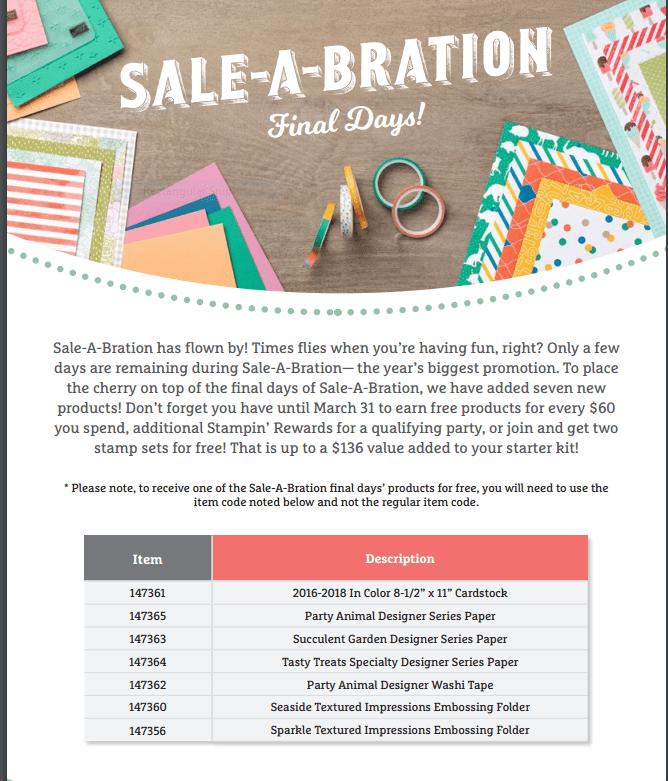 Sale-A-Bration ends in 10 days, on March 31st. And all FREE items are only WHILE QUANTITIES LAST, so don’t miss out on these amazing products! For every $60 order, you can choose 1 of the FREE items; spend $120 and choose 2 Free items. Place your order by either clicking on the button below, or contact me directly, and I’m happy to place your order for you. Which Colours Will You Choose?